Sustainable Fibres and Textiles provides a whole-lifecycle approach to the subject of sustainable textiles, from fiber production, through manufacturing and low-energy care and recycling. The scientific, industrial, regulatory and social aspects of this lifecycle are explored by an expert author team who bring global perspectives to this important subject. 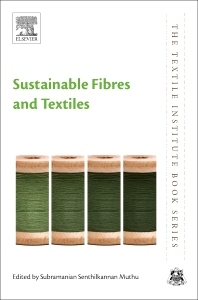 The first part of the book provides detailed coverage of the sustainable production of textiles, with chapters devoted to each of the main fiber types, including new biosynthetic fibers, such as textiles produced from Polylactic Acid (PLA). The second part examines sustainable production methods, focusing on low carbon production technologies and sustainable, low-pollution methods of processing and dyeing fabrics. The final sections explore the benefits of textiles designed to enable low-energy fabric care via both finishes used to treat the fabric and better care labelling. Re-use and recycling options are also covered, as are ethical aspects, such as fair trade fabrics.